The largest lake in Southeast Asia and one of the deepest in the world might sound pretty special. Even more special is the fact that it is located inside a large volcanic crater with an island called Samosir right in the centre of it. 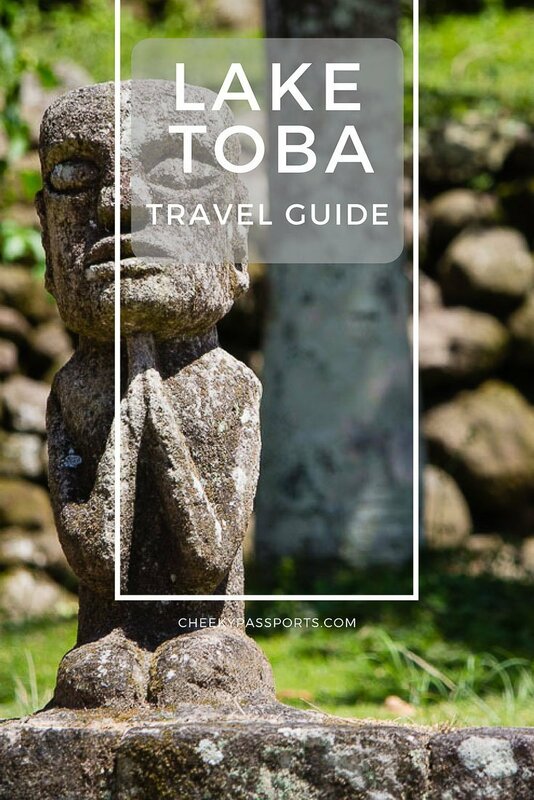 Here are some of the best things to do in Lake Toba and an introduction to this charming destination. Lake Toba is located within the large island of Sumatra in the western part of Indonesia, a few hours’ drive away from the city of Medan. 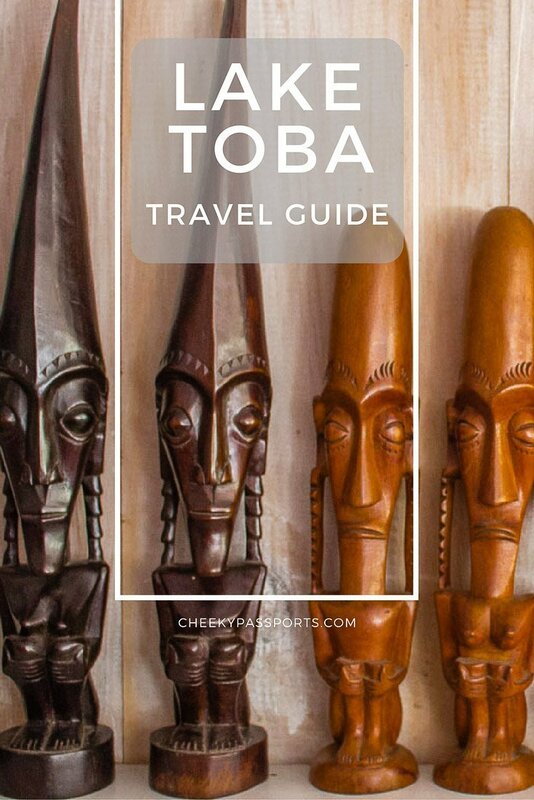 In our Lake Toba travel guide we will explain how to get there and the best things to do in the Lake Toba area. 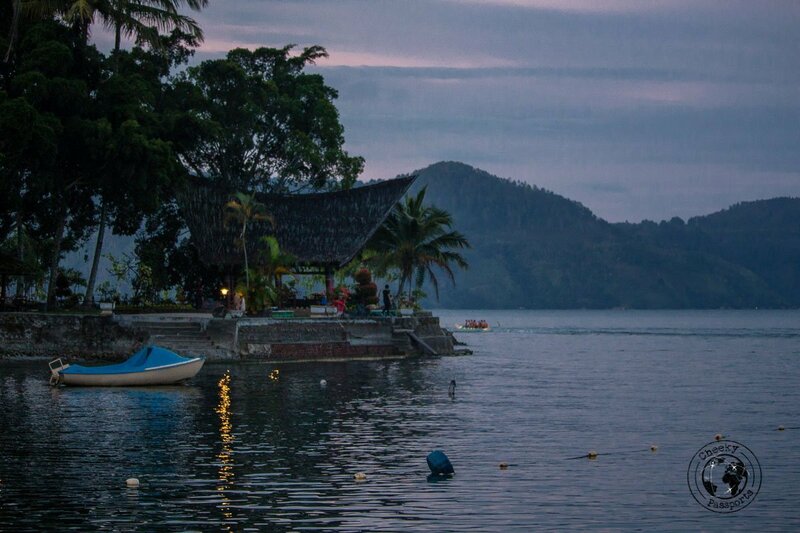 If we had to choose one word to describe Lake Toba, it would be tranquil. So much so, that we decided to extend our stay once we arrived there so that we could appreciate its peaceful vibes for longer and experience more of the Lake Toba attractions. We gladly discovered that there are ample things to do in Lake Toba, either on Samosir island or around the lake. Having trouble booking internal flights in Indonesia? Try using Kiwi or Nusatrip! Lake Toba is set at a much higher altitude when compared to Bukit Lawang, so when we arrived in Tuk Tuk, Samosir early evening, we immediately felt the chill. The welcome change in temperature and humidity warranted wearing a light long-sleeved cardigan most evenings. 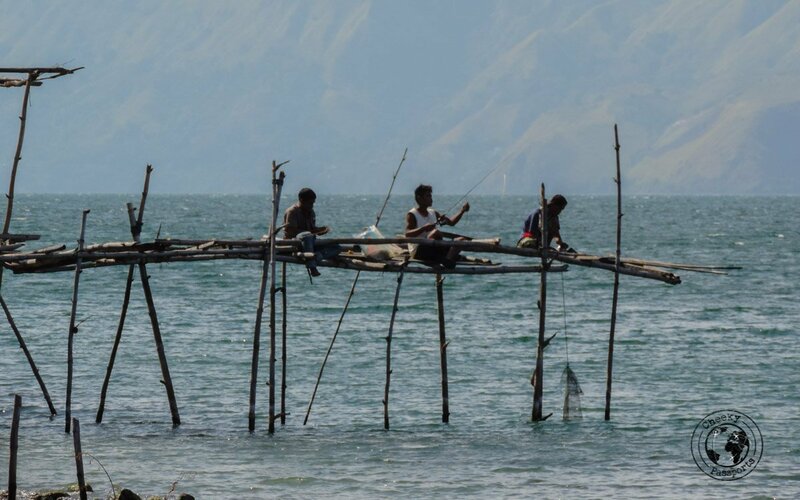 It is good to note that the people of Lake Toba belong to the Batak community. Their architecture is visibly different from that found in the rest of Indonesia. 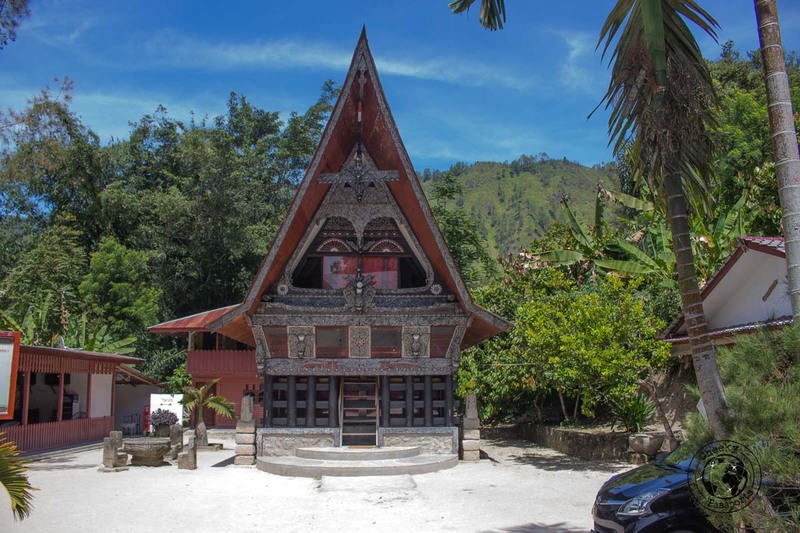 The traditional houses include a staircase in the centre of the building and the entrance is very low, making these some of the best lake Toba attractions. 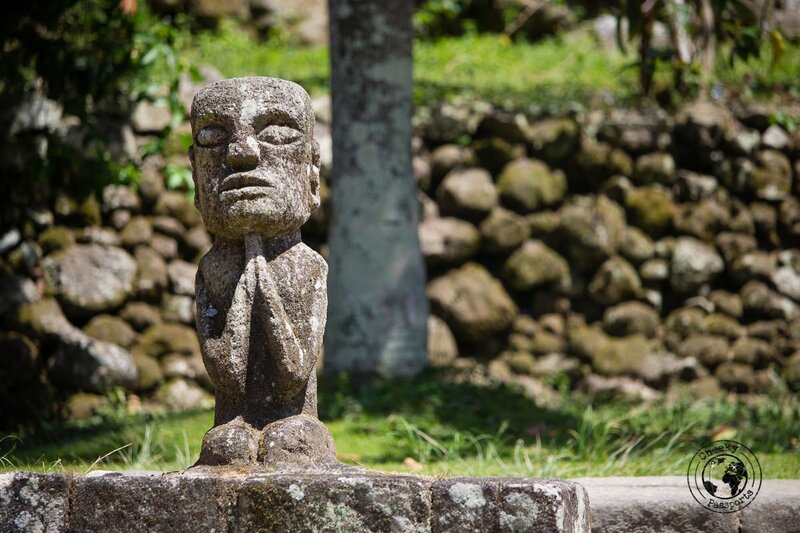 Historically the Batak people used to practise cannibalism but most were converted to Christianity in the 21st century. In fact, as we approached Parapat, the gateway to Lake Toba, the high concentration of Christian churches became more evident. Lake Toba is home an island within the lake with most hotels in Samosir island being located on its shores, especially in Tuk Tuk Samosir. 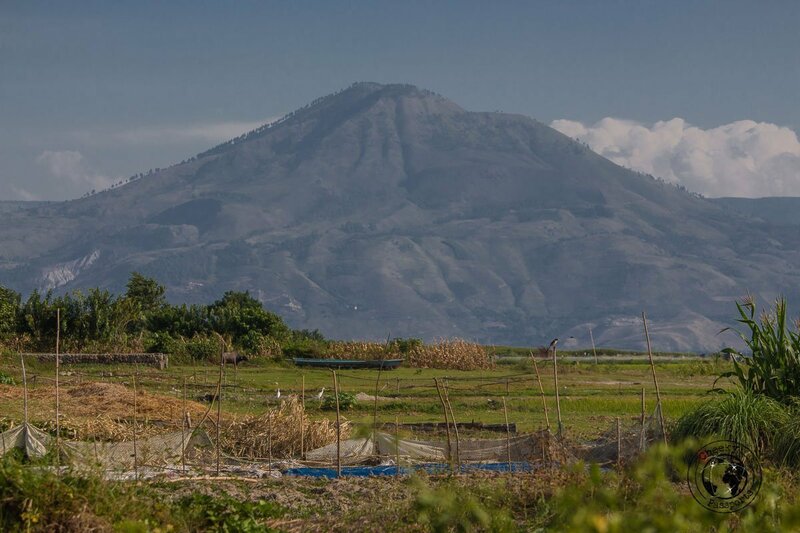 The town of Parapat on the mainland is also part of the Lake Toba area but is quite mundane when compared to the island, since most Lake Toba attractions are located on Samosir. 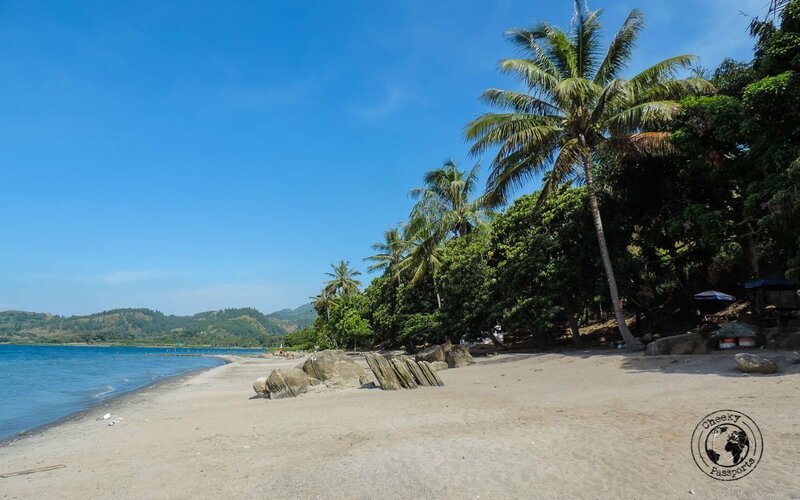 You might need to spend a night in Parapat if you miss the ferry to the island though! It is not difficult to get from Medan to Lake Toba via public bus which takes around six hours (to Parapat), either from the Amplas bus terminal or directly from the airport (this is more expensive than taking the bus from the terminal). It is also possible and very common, to charter a car from Medan to Lake Toba, or book a seat in a shared car, which might be a slightly more comfortable option (not always the case) than using the public bus. In some instances, the car will pick you up directly at your hotel whereby you will avoid the touts who are notoriously present in this bus terminus, and take you straight to Parapat. Due to the road condition, all southern transport from Bukit Lawang backtracks to Medan anyway. To get from Bukit Lawang to Lake Toba using public transport, one would need to get back to Medan’s terminus and from there follow the guide above (Medan to Lake Toba). Do note that this may increase transfer time by at least two hours and would be greatly subject to bus availability at Medan. We far preferred the option of booking two seats in a shared car going directly from Bukit Lawang to Lake Toba (Parapat) at the cost of 230,000 IDR (about €14.50) each. This transport was arranged by our great host at Ida Guesthouse. By directly, we mean changing vehicles half way and stopping two times for snacks/lunch, but that is all pre-organised and hassle free, and a relatively comfortable option for commuting directly from Bukit Lawang to Lake Toba. The ferry from Parapat to Samosir cost 15,000 IDR (€1) each (one-way). The ferry leaves every hour until 18.00 (check for the latest updates as this is subject to change at a day’s notice), and the rather pleasant journey takes about 30 minutes. We informed the boatmen of our destination (Tuk Tuk, Samosir), and the ferry dropped us off directly at our hotel by the water’s edge. Many of the hotels in Samosir island are located in Tuk Tuk, Samosir. Romlan Guesthouse catered to our needs perfectly. At 135,000 IDR (€8.50)/night for two people, we thought the chalet which included a private bathroom, was great value for money. We even had a porch where we could enjoy a couple of beers during sunset. Although we didn’t stay at any of the other hotels in Samosir island, we can confidently recommend this one, unless you need strong wifi during your stay! Wifi was only available at the reception, and was terrible, yet the guesthouse served great food and real café latte (not the condensed milk version) so we enjoyed eating at the hotel’s restaurant a couple of times. It’s also located in a great spot in Tuk Tuk, Samosir and makes for a great base from where to visit the Lake Toba attractions! 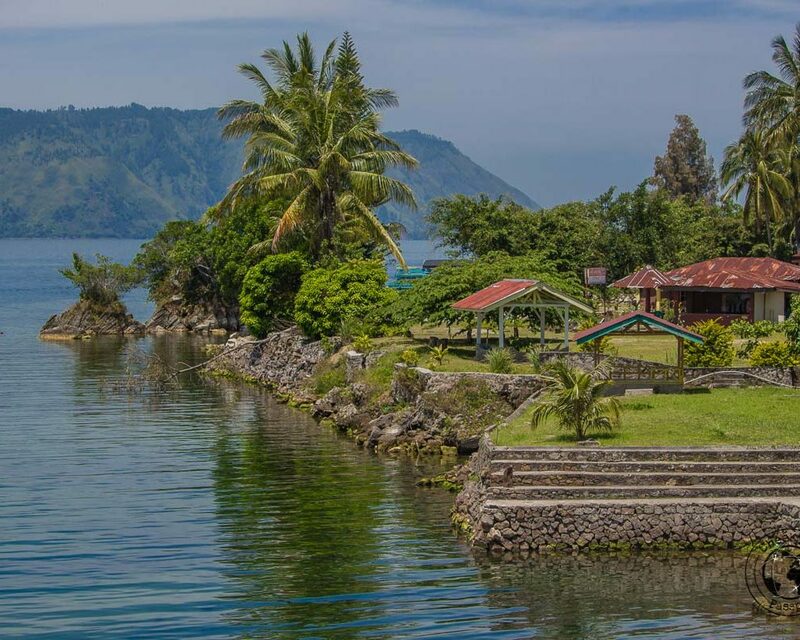 Lake Toba is the ideal destination for relaxing and taking a break from the hectic side of Indonesia. 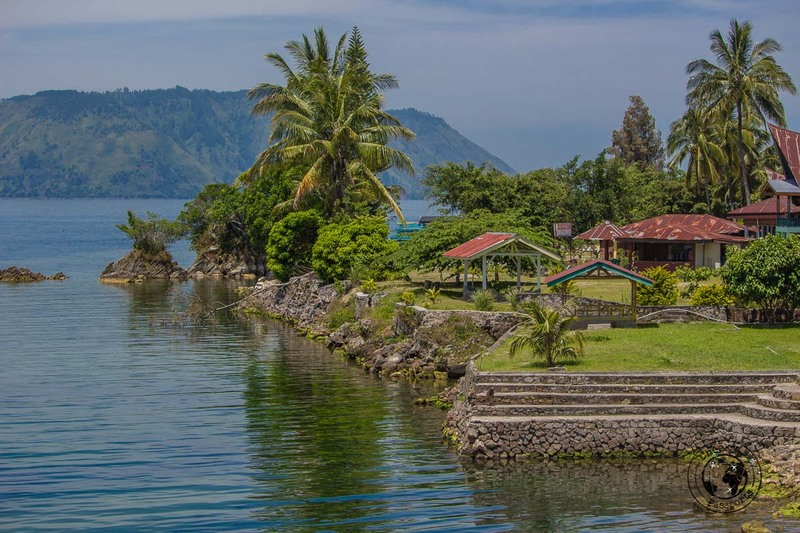 The great thing about Lake Toba we thought, is that it is very quiet when compared to other destinations in Southeast Asia and you can easily do your own thing without anybody getting in your way, which is not always the case with more popular destinations. It is very easy to lie on a hammock at the water’s edge with a beer in hand and put aside your thoughts for a few days, making this one of our favourite things to do in Lake Toba! Being relatively inexpensive, home to cool weather and some lovely people, Samosir on Lake Toba seems to bring together the perfect ingredients for a very serene retreat. We were not too surprised to learn that some backpackers we met in Tuk Tuk, Samosir had decided to extend their few days’ stay into a few weeks’ stay! Tomok village is a few kilometres away from Tuk Tuk, Samosir and is a little bit larger. It is also the only place on the island with ATMs (two not one, as has been reported elsewhere) as well as an Indomaret and an Alfamart. There are also local shops from where you can buy fruit and vegetables and souvenir shops with “Lake Toba” items. 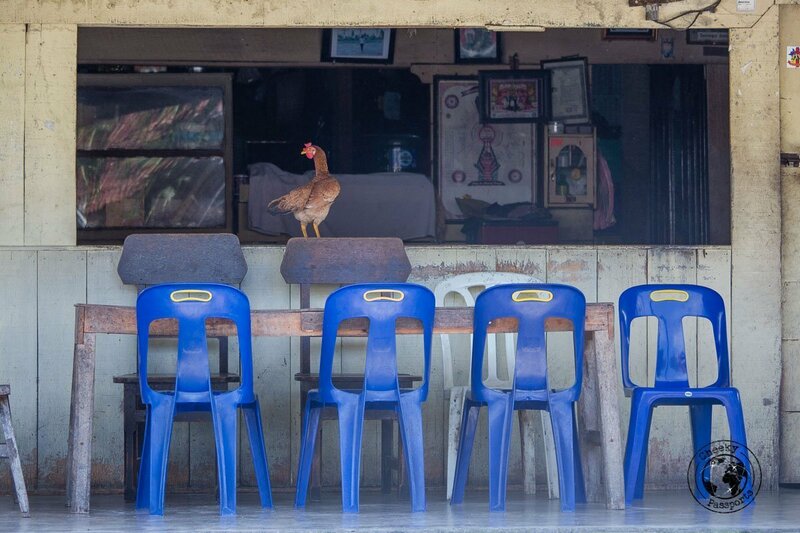 Tomok village is the go to place for a wider range of supplies than can be found in Tuk Tuk. 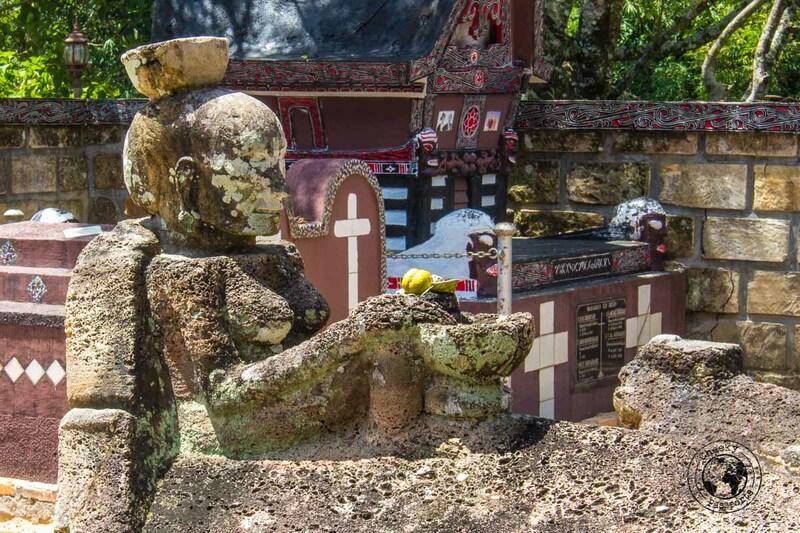 One of the most important of the Lake Toba attractions lies in Tomok village, a few kilometres away from Tuk Tuk, Samosir, so if you need supplies from Tomok, visiting the tomb at the same time makes sense. You will be given a sash to wear as you enter the site and there’s no entrance fee but a donation is expected and asked for. A 5k note should suffice. We thought it was amusing and rather sweet that the person handing out the sashes seemed to be colour coordinating them to the individual tourists’ clothing! The tombs are accessed from a side road of the Tomok main road. The road leads up to the Batak museum (where you can easily park your bike) and then continues on the right-hand side to the tomb through a path lined with souvenir shops. 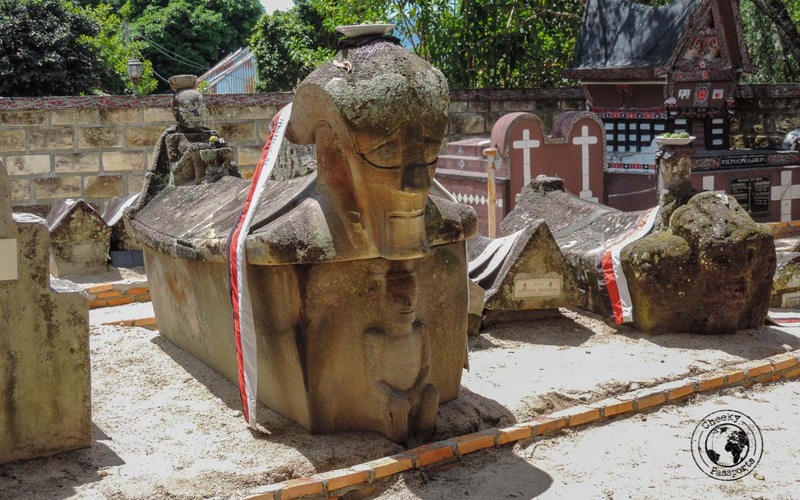 Be sure to put the tomb on your list of things to do in Lake Toba! 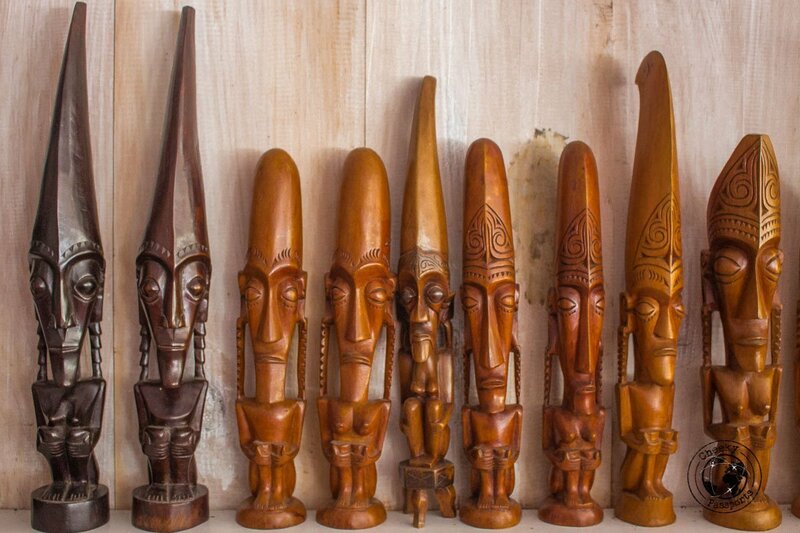 The Batak museum is located inside a traditional house in Tomok village and the collection of traditional Batak items is very small but interesting enough to make it to our list of things to do in Lake Toba. However, we were sad to observe was a monkey chained to a tree within its grounds. There are also toilets in the museum grounds which proved to be very convenient that particular day! Put the ancient Batak village of Huta Siallagan in Ambarita, characterised by traditional houses of the Batak ethnic group, on your list of things to do in Lake Toba. 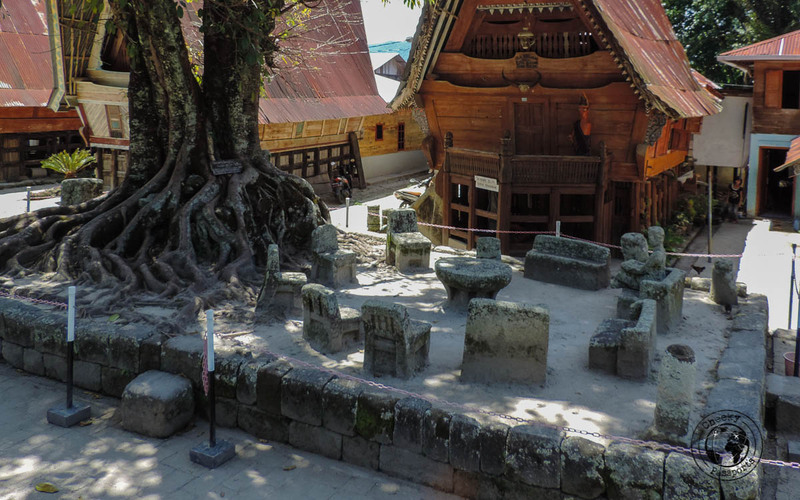 The village is home to one of the most famous Lake Toba attractions – chairs set in a circle which have been carved from stone and are located near a Hariara tree which is considered to be sacred. The stones are thought to be about 200 years old but this is not really confirmed. One set of stones was used as a meeting place whilst the other was used as an execution place. Be sure to read up the history of the place before you go there, otherwise they are just….. stones. 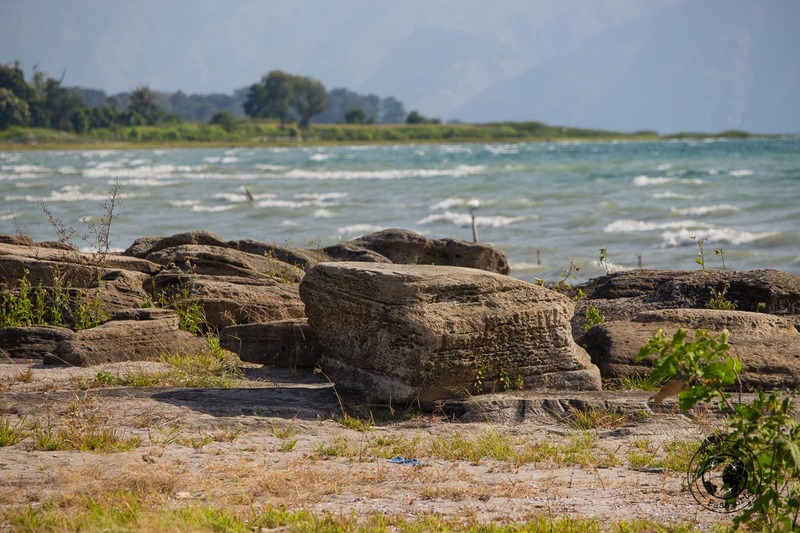 Riding a motorbike around Samosir was easily one of our favourite things to do in Lake Toba, since it enabled us to visit all the Lake Toba attractions at our own pace. 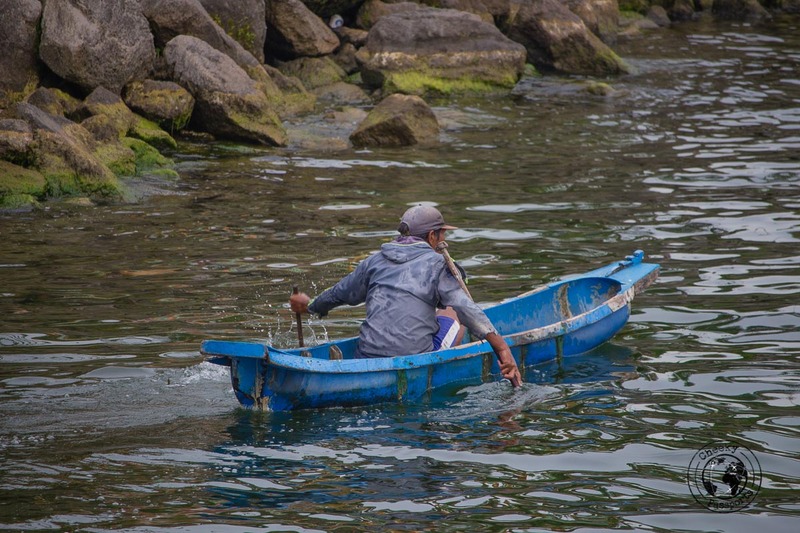 The other transport options include using boats and bicycles, but hiring a motorbike allowed us to explore and discover the island in a lesiurely manner. We rented a bike from Tuk Tuk, Samosir for 90,000 IDR (€5.60), inclusive of fuel, for a full day. We drove through quaint villages where huge water buffalo were grazing in the lush fields accompanied by white gulls flying overhead. 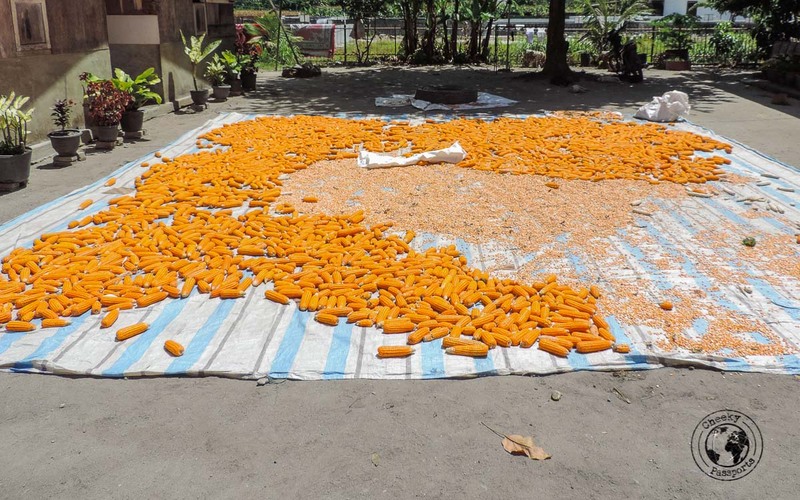 Ears of corn lay on the ground, drying slowly under the scorching sun. School children greeted us happily as we passed by and villagers curiously wanted to know where we were heading. Driving around Samosir introduced us to the beauty, serenity and tranquillity of the island and the friendly nature of its people. At one point I felt so relaxed that I was about to doze off at the back of the bike, until another bike came close with the driver shouting something at us. Being on a remote part of the island, I was sure that we were about to be robbed, but the local guy just drove off. A few meters down, the bike started to wobble a lot. We had a flat tyre, and the kind driver was only trying to warn us! Some villagers stopped and somehow we managed to understand that the repair shop was (luckily) only a kilometre away, so we wobbled and skidded all the way to the shop. The shop which was just a small shack, seemed to be run by a couple of teenage kids who had great difficulty in extracting the inner tube from the tyre. After about an hour and lots of shouting at each other from their end and “wait mister” every five minutes, it was replaced and we were on our way to the beaches! Do not expect the beaches on Samosir to be anything like those on Indonesia’s remote islands. These are lake beaches which lack the sparkly blue turquoise water and soft white sand of the ocean. Still, you can swim in the lake and chill out on the sand which, although not as soft as that on the ocean beaches, is still comfortable enough for whiling away a few hours on the lake shore. 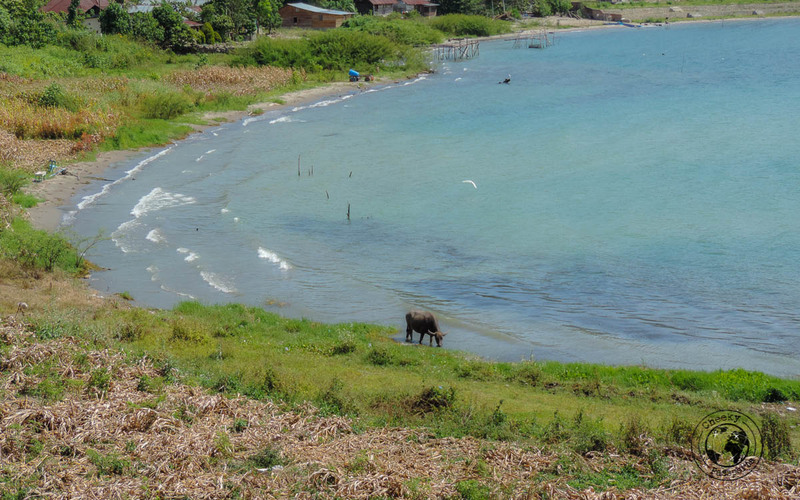 This beach is accessed from the main road a few kilometres away from Ambarita. It was very quiet when we went, there were a couple of warungs from where we bought water and snacks and we just sat on logs watching the local kids playing in the water. Some fishermen were poised on stilts holding rods and nets into the water, no doubt hoping for a good catch of lake fish to grill on the barbeque. There are some large trees on the beach which provide shade from the sun thus offering the perfect reading spot! This beach was extremely windy when we visited and we didn’t stay too long. 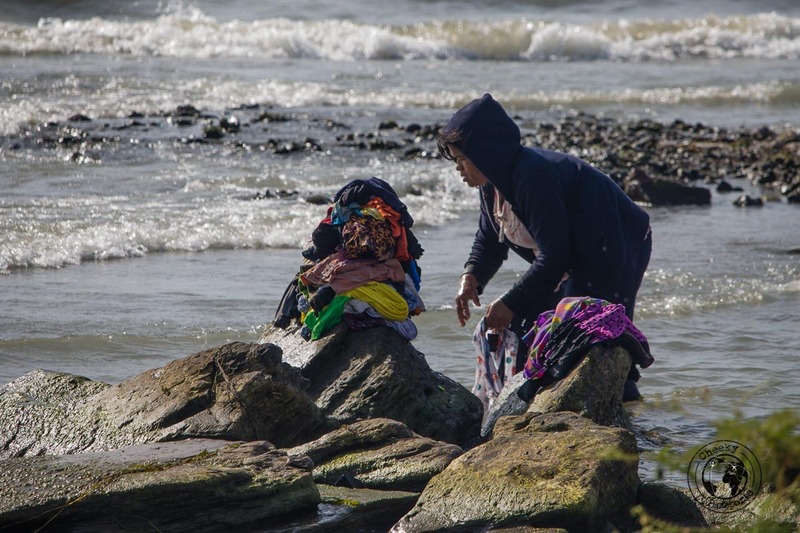 Local women washed their clothes at the water’s edge and young men chatted under the shade off the trees as they stared curiously at our approaching bike. The shore was filled with seashells and rather pretty, but the water was far too choppy for a swim. We don’t recoemmend it as one of the best things to do in Lake Toba but it is interesting enough, especially if you’re looking for some peace and quiet! This is the most popular beach on Samosir due to its white sands, but it is located on the opposite side of the island to Tuk Tuk. 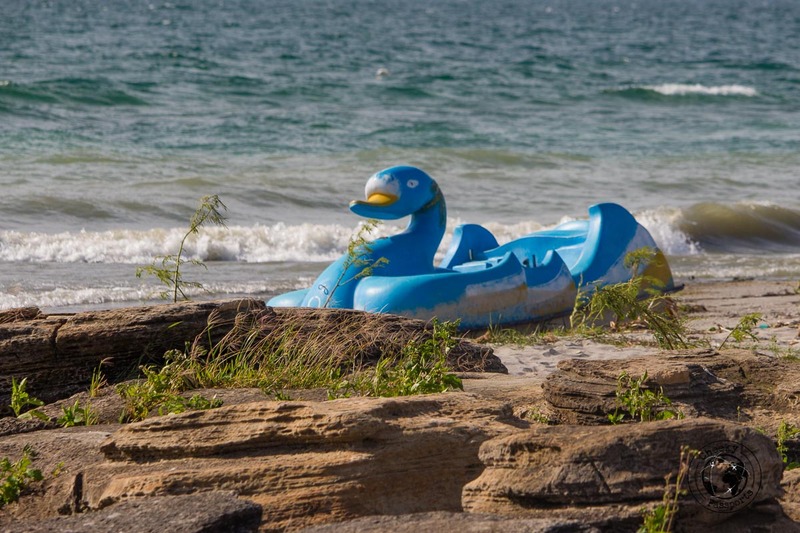 Water activities such as banana boat rides and jet ski rides are available at this beach, which although pretty, can get crowded in weekends. Because of this, we were not very enthusiastic about visiting, preferring to spend time on the quieter beaches instead. Lake Toba is home to several waterfalls, the most popular of which are Efrata waterfall, Binangalom waterfall, Simangande waterfall and Gibeon Hill waterfall, some of which are in Parapat, on the other side of the lake of Tuk Tuk, Samosir. 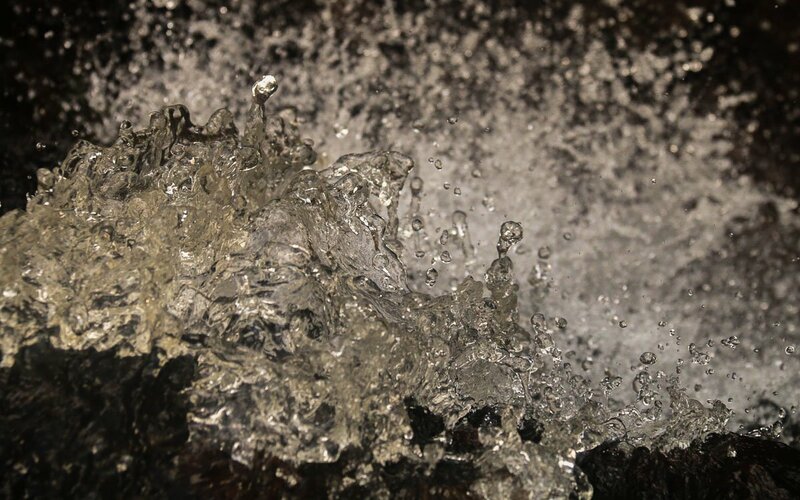 The waterfalls were all rather far or not easily accessible from Tuk Tuk so we did not visit, but they are great destinations if you plan on spending more than a few days on the island and would like to add a few more Lake Toba attractions to your itinerary. Also located on the opposite side of the island to Tuk Tuk, the hot springs have a sulphur smell and are apparently really hot and by no means refreshing, so we missed visiting the springs since they did not seem to justify the distance we had to cover to go there. Not easy to get to and small in size, this lake is remarkable for being a “lake inside of a lake”. We don’t advise you to go if you are staying in Tuk Tuk, Samosir and are short on time, but it is worth driving there if you have ample time to explore more of the Lake Toba attractions. We ate all our meals in the village of Tuk Tuk, Samosir since we found it to be a very convenient village from where to explore the Lake Toba attractions. This was our favourite restaurant by far – a cozy little place with few tables where we had most of our breakfasts and dinners. Omelettes and banana porridge and coffee for breakfast meant that we started off the day on a very good note, and ended it with huge portions of aubergine curry, pork steak and pork tacos which were more like huge calzones! We ate our first meal in Tuk Tuk at the restaurant in Romlan Guesthouse, since this was our choice of accommodation out of the hotels in Samosir island. We enjoyed the food, but thought that it was slightly expensive when compared with similar fare at Today’s Café. The fried aubergines were to die for though! 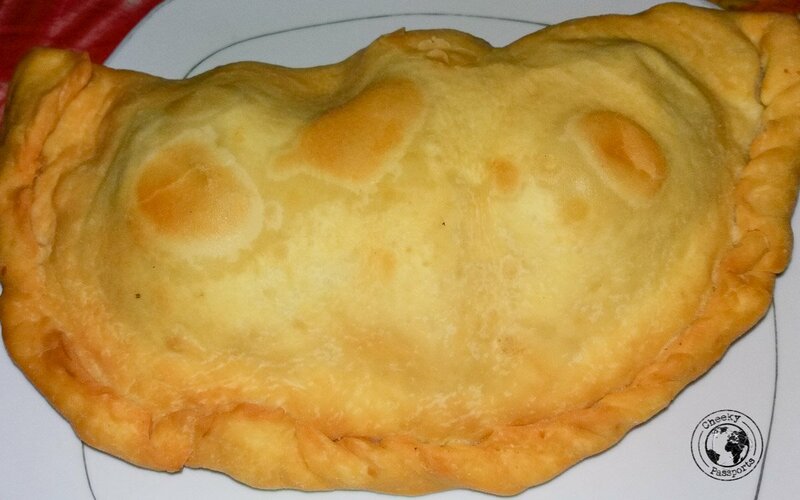 We dined at Elio’s restaurant on our last night and were not disappointed by the fresh food we were served. Our only disappointment was not having had the grilled fish which we saw served in huge portions at the neighbouring table! Unfortunately, we couldn’t come back to try that out! With so many things to do in Lake Toba, we firmly believe that it is one of the best destinations on the island of Sumatra and we hope that if you ever go there, you get to enjoy your stay as much as we did! Loved this place! Did you manage to go around all the island? We were very tempted to hire a bike but since we never drove one we were a little afraid. Seeing your pictures is making me regret missing this opportunity 🙁 What an experience!